When I was little I was not a fan of chickpeas because of their grainy consistency and somehow I though I didn’t like the flavor even though I maybe tasted them only once before avoiding them like poison. 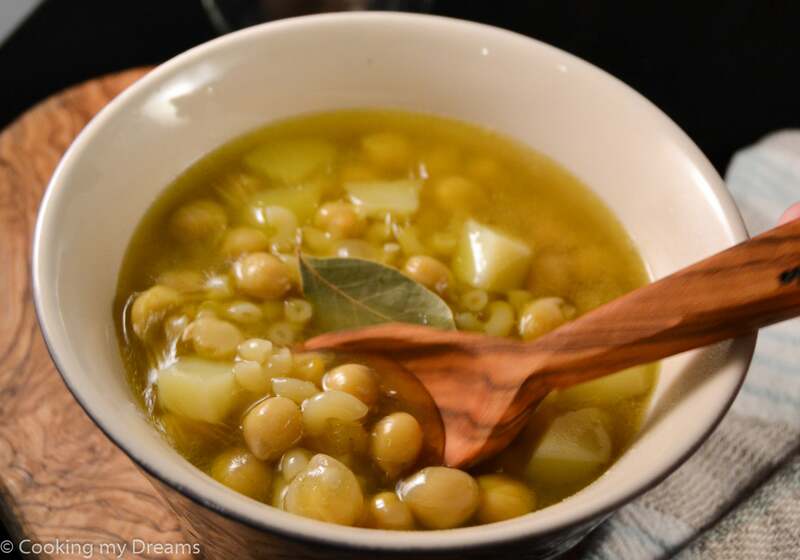 Growing up I was not really looking to eat chickpeas as well, I was not avoiding them but if I could choose between two options I would never choose the chickpeas. Once you have mindset set up in a certain way from when you’re little, is really difficult to overcome it. Same thing for me goes with the pickled pearl onions, I was little when I felt sick after eating lots of them and since then I’m disgusted by the though of eating them again. To this day I have never tried again a single pickled onion. I don’t remember the flavor so it may be the best thing in the world but my mind simply to not even want to think of trying them again. Do you have a similar issue with some kind of food? Anyway, chickpeas. I ate them once in a while when occurred and could not be avoided but my reaction was always –meh-. 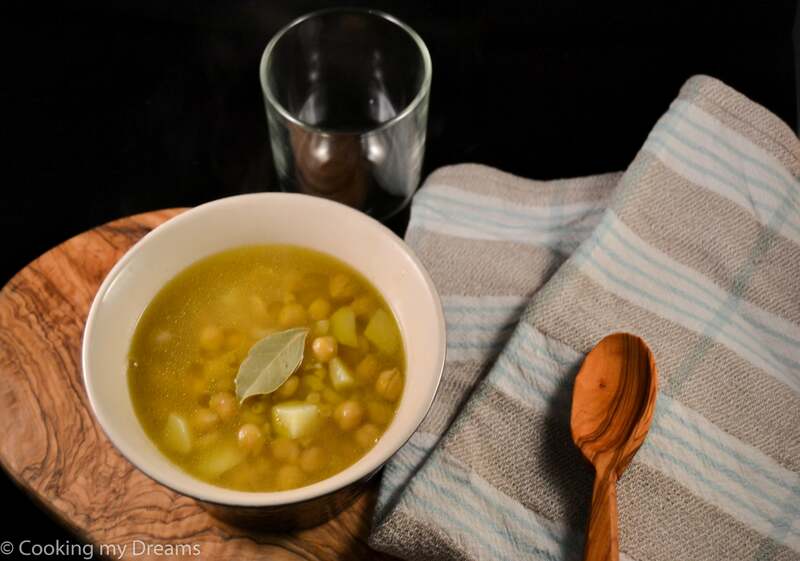 Then, last winter when I was home for the holidays, my mom made this chickpea soup. When she told she was making my internal reaction was –oh no, chickpeas, why?? ?– but I decided to be brave and sit quietly and eat the soup like a good girl. Useless to say, it was a revelation. My eyes popped out and I asked my mom “wow! How did you do this? What’s the recipe?” my mom looked at me a little bit puzzled like I was asking the stupidest thing in the world “there’s no recipe, I just do it simple like this…..“. Ok, I have to try it myself to believe that it’s so simple. 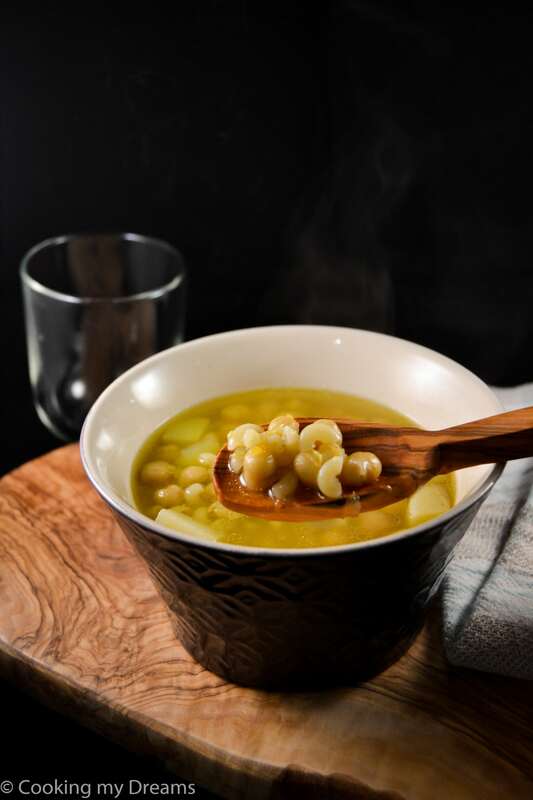 So here’s the recipe for you to comfort in the cold winter nights. If you’re not a fan of chickpeas as I was you have to try anyway. It’s so simple yet so flavorful. To me it’s the perfect winter soup. Notes: You can find the recipe and instructions for the Soffritto in this post. In a large pot drizzle the extra-virgin olive oil and add the finely chopped soffritto, stir fry at medium heat for a couple of minutes (make sure it doesn't burn otherwise it will give a bitter taste to the soup). Add the drained chickpeas and cook for a couple of minutes more. With a cooking twine, tie together the bay and sage leaves with the rosemary twig and drop them in the pot. Chop the potato in small cubes and add it to the pot, then add the vegetable stock (enough to well cover the vegetables) and let it simmer for about 15-20 minutes. According to the cooking time of the pasta you chose, add the pasta to the pot in time so that the potato will not overcook.